Southern Thailand has some world-class dive sites such as Hin Daeng, Hin Muang, Koh Haa and Koh Bida. These sites are quite remote but Koh Lanta is the best located island to use as a base to explore the superb diving in this area. Phuket and Koh Phi Phi are more famous, but Koh Lanta has the best access to the best diving. 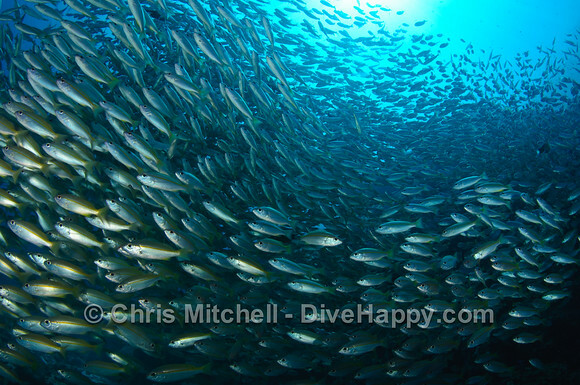 A 2 Day / 1 night Koh Lanta liveaboard is the easiest and cheapest way to see Koh Lanta’s dive sites. Koh Lanta is much nearer to the major dive sites of Southern Thailand than either Phuket or Koh Phi Phi – and only on Koh Lanta will you find regularly scheduled trips to Hin Daeng and Hin Muang and Koh Haa, all three of which are unmissable sites to dive in Thailand. For more detailed information about each of Lanta’s dive sites, see our videos filmed on location and read more on our Koh Lanta dive sites page. From Koh Lanta it’s also possible to explore the world famous Similan Islands as well as Koh Lanta’s dive sites on a five or seven day trip on the Koh Lanta liveaboard MV Flying Seahorse. Not only does the liveaboard provide the cheapest way to see all these great dive sites, it also means you get there first in the morning before daytrip boats arrive. As well as the Similan Islands, you can also join a five day liveaboard or seven day liveaboard from Koh Lanta to Koh Lipe, exploring the diving along Thailand’s southern coast down to Malaysia. To read more about the Similan Islands dive sites, please see our Koh Lanta And Similan Islands Dive Sites page. Koh Lanta itself provides a perfect place to relax before or after a dive trip – the island is very laidback with beautiful, empty beaches that are a complete contrast to the crowds of Phuket and Koh Phi Phi. There is a wide range of accommodation to suit all budgets and plenty of great beach restaurants and bars to enjoy Koh Lanta’s spectacular sunsets.